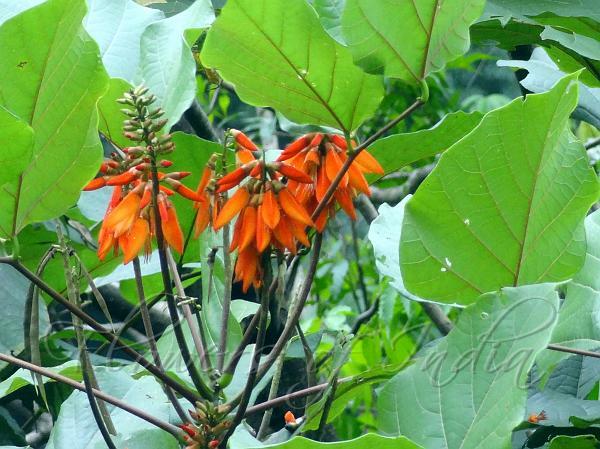 Himalayan Coral Tree is a deciduous tree, growing up to 5 m tall, with the trunk and branches covered with prickles. Stipules are small, stalks longer than leaflets, without or with a few prickles. Leaves are trifoliate with terminal leaflet kidsney-shaped, 8-20 cm, both surfaces hairless, base flat or somewhat heart-shaped, margin entire, tip pointed, lateral leaflets obliquely broadly heart-shaped. Flowers are borne in solitary racemes in axil of terminal leaf, erect, longer than leaves. Flowers are in clusters of 3, red, pendulous, bract 1, ovate. Calyx is turban-shaped, truncate or unequally 2-lobed. Flowers are red, standard subovate, boat-shaped, about 3.2 cm, wings obliquely ovate, shorter than keels, keels about 1/2 as long as stamens. Filament slightly shorter than standard, fused near base. Style is as long as stamens. Pods are curved, 12-19 x 2-3 cm, with obvious beak and stipe. Seeds 5-10, white or brown, kidney-shaped, about 2 cm. 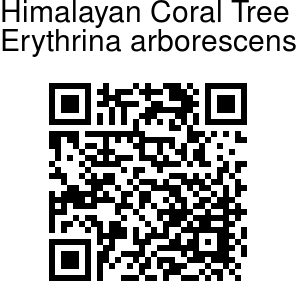 Himalayan Coral Tree is found in the Himalayas, from Kumaun to Bhutan, Assam, Burma, China, at altitudes of 1500-3000 m. Flowering July-September.